Follow basic safety practices to minimize risk when working with hazardous chemicals. Pay attention to the health hazards and physical hazards of the materials you use. These guidelines apply to all UC San Diego laboratories, shops, and studios and meet the requirements of the Chemical Hygiene Plan. Important – Read about how the Globally Harmonized System of Classification and Labeling of Chemicals (GHS) incorporated into the federal Hazard Communication Standard affects chemical use at UC San Diego. Never work alone when hazardous chemicals are involved. Maintain an organized and orderly facility. Keep the work area clean and uncluttered. Never play practical jokes or engage in horseplay. Follow chemical storage and compatibility guidelines. Maintain lean, well managed chemical inventories to avoid fire code violations and subsequent inventory reduction measures. Keep corridors free of hazardous materials at all times, without exception. Note: There are provisions to allow specific non-hazardous materials to be stored in exit corridors. Such items must be seismically secured and pre-approved by Environment, Health & Safety (EH&S). Communicate hazards to everyone in the facility. Keep containers closed except when in use, including hazardous waste containers. Read the Safety Data Sheet (formerly called Material Safety Data Sheets) before beginning work with a chemical. Follow hazard control plans for extremely hazardous materials. Pay particular attention to control measures for chemicals that are known to be particularly high hazard or chemical carcinogens. Never smell chemicals to identify them. Be aware of electrical hazards. Keep electrical panels clearly visible and unobstructed. Know how your circuits are labeled so equipment can be de-energized quickly in an emergency. Never use extension cords as permanent wiring. Unplug them at the end of the workday. Mount multi-plug adaptors a few inches off the floor to avoid possible water damage. Never use multi-plug adaptors in series. Replace any damaged or frayed electrical cords immediately. Do not eat, drink, store food, smoke, or apply cosmetics in areas where chemicals are in use except in clearly marked Clean Areas. Wash your hands frequently and before eating. Keep loose hair tied back. Use chemical fume hoods and other engineering controls as needed. prevents vapors and related odors from being emitted back into the laboratory or system exhaust. There have been incidents at UC San Diego where improper trapping caused serious failure of building vacuum pumps and in one case in 2009 the explosion was so severe that the pump was completely destroyed leaving the vacuum system in disrepair for months. Luckily no one was injured. To prevent contamination, all lines leading from experimental apparatus to the vacuum source should be equipped with filtration or other trapping as appropriate. For most aqueous or non-volatile liquids, a filter flask at room temperature is adequate to prevent liquids from getting to the vacuum source. For solvents and other volatile liquids, use a cold trap of sufficient size and cold enough to condense vapors generated, followed by a filter flask capable of collecting fluid that could be aspirated out of the cold trap. For highly reactive, corrosive or toxic gases, use a sorbent canister or scrubbing device capable of trapping the gas. are cheaper and less likely to foam. with the trap, oxygen may condense from the atmosphere and react vigorously with any organic material present. Use PPE as needed or required. See Personal Protective Equipment requirements and resources for research and non-research facilities. Follow requirements for high hazard chemicals. Requirement: To create hazard control plans* (HCPs) for work with high hazard chemicals, use the HCP application. See the "High hazard chemicals list" on the HCP page. See Specific Chemical Guidelines for more information about particularly high hazard chemicals. * At UC San Diego, a hazard control plan is a standard operating procedure (SOP). Prepare for accidents and emergencies. Clean up only very small quantities and only if you have been properly trained. All other spills should be cleaned up by specially trained personnel. 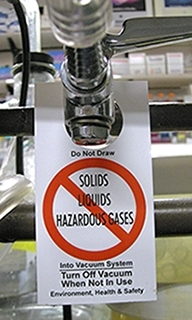 Read How to Handle Chemical Spills in Laboratories. Keep a fully stocked chemical spill kit easily accessible. Train personnel on how to use the spill kit, and when it is safe to do so. Read Fire Extinguisher Types and Maintenance to learn about different types of extinguishers and how to have them serviced or replaced. Get training: see Fire Extinguisher Training for options. Read How to Use a Fire Extinguisher. Check your fire extinguisher monthly to ensure it is charged and accessible. Some laboratories have emergency override buttons (see image at right) installed to provide maximum room ventilation in the event of a chemical emergency that impacts laboratory air. Activate this button only if you feel laboratory air has been impacted by a chemical emergency. Open the clear cover and push where it says PUSH HERE. Once activated, room air supply and exhaust will be ramped up to maximum capacity to ventilate the space. Evacuate all personnel from the space immediately. Stay out until the room is cleared for reentry. Contact UCSD Police after activating the EOB: Call 9-1-1 from campus phones. Provide the police with any useful information. When the issue has been resolved, the EOB will be deactivated by authorized personnel and the space will be declared safe for reentry. First aid kits (PDF) and Emergency Guides are provided by EH&S in work areas using hazardous materials or generating hazardous waste. The department representative, typically your Area Safety Coordinator, is responsible for monitoring first aid supplies and expiration dates. Contact EH&S, (858) 534-3660, if they are missing, damaged, or to request replacement supplies for EH&S-provided first aid kits. Dispose of chemical waste according to UCSD guidelines. Contact the EH&S Chemical Hygiene Officer, (858) 822-1579.